Jadeite and Tuxedo Kamen beginning to fight. Jadeite after he'd "killed" Tuxedo Kamen. Nephrite explains the power of the stars. Zoisite gloating as he watches Nephrite die. Queen Beryl blasting Zoisite to death. Jadeite:	We meet again, Tuxedo Kamen. You will die also. Tuxedo Kamen: (you can tell when he starts speaking 'cause his music starts) Villain who plays tricks on innocent people with your magic, you will pay. 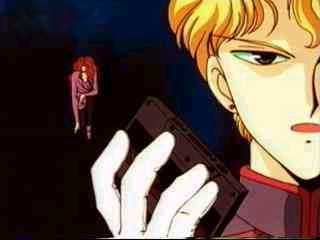 Nephrite:	Fool Jadeite. He used such a silly method, extracting energy indiscriminately. Beryl:	Then, how would you go about it, Nephrite? Nephrite:	Humans are all controlled by the movement of the stars, leading different fates. The same could be said about energy. There is a moment in their lives when their energy reaches its peak. Thus, I will select the prey whose energy level is reaching its peak by reading the stars. Nephrite:	Put more weight into the ball. Nephrite:	A fly would land on a serve that slow. Zoisite: [to his youma] Well done. The kurozuishou is mine. [to Nephrite] Aren't you lucky to be able to die with the one you love? [to youma] Torture him as you please. Zoisite: This lady is the next target. The top student at Azabu Technical institute. Zoisite: Kunzite-sama! That's terrible! She's just an ugly youma, and you call her attractive? Kunzite: Zoisite, jealousy doesn't suit to your beauty. Kunzite: Even this rose cannot surpass to your beauty. Beryl: [changing her attention from Kunzite to Zoisite] Meanwhile, Zoisite. Are you prepared? Beryl: You attempted to kill Tuxedo Kamen against my orders. Kunzite [desperately interrupting]: I am responsible for... wait! Beryl: Dispose of the carcass. Hotaru: [to Haruka] Welcome back! and take notes on what we're telling you.